Astronomers have discovered a new kind of asteroid — a strange mini-world with a unique and violent history that could reveal more clues about the early solar system. The asteroid, called 1999 AT10, is a miniature space rock born when a collision blasted it out of its rocky parent Vesta, which is the second-largest asteroid in the solar system. The mineralogical composition of 1999 AT10 suggests that unlike many other asteroids, it did not originate from the outer rocky crust of its parent asteroid Vesta, but from the deeper layers underneath. Until now, no asteroid like it has ever been seen. Vesta is of particular interest because this summer it will be the first destination of NASA's Dawn spacecraft. The discovery of 1999 AT10could help determine the thickness of Vesta's crust, and reveal details about its internal structure, scientists say. With a body approximately 326 miles (525 kilometers) wide, Vesta is believed to be the only remaining protoplanet from the early phase of our solar system. The new asteroid was discovered by researchers from the University of North Dakota and from the Max Planck Institute for Solar System Research in Germany, using NASA's Infrared Telescope Facility on Mauna Kea, Hawaii. The asteroid Vesta is unique. Unlike main belt asteroids, which orbit the sun between Mars and Jupiter, Vesta has a differentiated inner structure. A crust of cooled lava covers a rocky mantle and a core made of iron and nickel — quite similar to the terrestrial planets Mercury, Venus, Earth and Mars. Scientists consider this onion-like asteroid to be a protoplanet, a relic from an early phase of planet formation more than 41 /2 billion years ago. All other protoplanets in the solar system either accumulated to form full-blown planets or broke apart due to violent collisions, researchers said. These so-called Vestoids — a group of asteroids with a composition similar to that of Vesta — were most probably created due to this impact. Since some meteorites that were found on Earth consist of rock similar to Vesta's mantle, scientists suspect that this collision also hurled material from deep within the asteroid into space. But until now there was no source in the form of near-Earth Vestoids for these meteorites with Vesta's mantle composition. Near-Earth asteroid 1999 AT10 fills this gap. Researchers were able to analyze the infrared radiation that 1999 AT10 reflected into space and compare its characteristic spectral fingerprints with those of Vesta. Apart from the calcium-rich mineral wollastonite, the measurements primarily point to the presence of the iron-rich material ferrosillite. "These materials can be found in Vesta's mantle and crust," Andreas Nathues of the Max Planck Institute said in a statement. '"However, the ratio is decisive." In the case of 1999 AT10, the concentration of iron is clearly lower than in any known Vestoids. "This all points to 1999 TA10 having originated from the interior of Vesta." 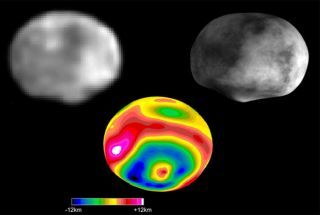 More clues of asteroid Vesta? The newly discovered body allows astronomers to form new insights into its parent asteroid, researchers said. Models of Vesta's surface based on observations made by the Hubble Space Telescope suggest the south pole crater is about 16 miles (25 km) deep at the most. The new mini-asteroid now suggests that this would be the maximum possible thickness of Vesta's outer crust. In order to reconstruct the processes that led to the formation of planets more than 4.5 billion years ago, scientists need to determine the thickness of Vesta's layers as precisely as possible. Only this makes it possible to calculate from which material mixture the protoplanet was made — and thus which materials were present when the solar system formed. The finding was published Dec. 5 in the journal Icarus. Editor's note: This story was updated to correct an error in the diameter of Vesta.